Known as “the silent killer”, hepatitis C is thought to affect between two and five per cent of the population in Cambodia. Until now, many people had no access to affordable treatment. 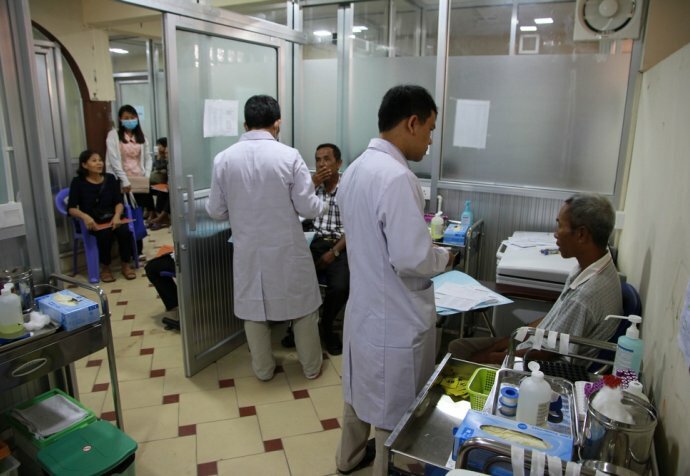 A Médecins Sans Frontières (MSF) clinic in Phnom Penh is offering new hope. In Australia, a hepatitis C diagnosis is in no way a death sentence. A payment of around $40 will buy a three-month course of direct-acting antivirals (DAAs) to fight the infection, a treatment breakthrough which has shown a 95 per cent cure rate and fewer side effects than previous medications. But in a country like Cambodia the hurdles to treatment are much higher. There is no national program to target hepatitis C, and access to DAAs is limited. A course of the drugs usually costs over $1,000 – an overwhelming price tag for most Cambodians. In October 2017 MSF negotiated cheaper deals for generic DAAs, enabling wider access for our patients. While the prevalence of hepatitis C in Cambodia is unclear, it is estimated between 300,000 and 750,000 people from a population of 15 million suffer from the blood-borne disease. Many do not know they have it: the infection is slow-moving and often displays no symptoms for years, meaning it can go unnoticed until serious liver damage has already been caused. Untreated, it can lead to liver cancer, cirrhosis (scarring of the liver) and death. In a tiny basement area of Preah Kossamak Hospital in the Cambodian capital Phnom Penh, in September 2016 MSF opened the first clinic in the country to provide hepatitis C treatment free of charge. Working alongside the Cambodian health ministry, the project aims to provide the most effective drugs alongside rapid-test diagnostics, and to create a simplified and cost-effective model of care, paving the way for a national hepatitis C guideline and program. MSF opened a second site in the town of Battambang in March 2018. From the beginning, staff were overwhelmed by the number of people coming in the doors – sometimes up to 100 per day. Head of Mission Mickael Le Paih was surprised by the demographics of patients. “A big chunk of positive patients are older. The median age is 55 and 91 per cent are over 40,” he says. Many have travelled long distances to reach medical care, with 70 per cent of people coming from outside of Phnom Penh. Patients report having been diagnosed with the disease years, sometimes decades, ago. Until now, they have been unable to access treatment. Sokha, 61 years old, lives on the outskirts of the city. She was first diagnosed with hepatitis C 20 years ago but hadn’t had any formal treatment before coming to the clinic at Preah Kossamak Hospital. “I have been waiting and living with the tiredness for 20 years. I feel that after I get treated I will be very happy. I will start my new life,” she says. Another patient, Savorn is a 50-year-old father of three from Phnom Penh. “Before I started this treatment, I felt hopeless. I couldn’t afford the new treatment and was waiting to die. I needed to sell my house…[but] if I sold my house, my kids would not have any shelter,” he says. MSF staff are also providing free tests and treatment in a drop-in centre run by Mith Samlanh, a charity which provides food, shelter and help with drug addiction to young adults on the streets of Phnom Penh. Chenda was one of the first clients to be tested positive. He sleeps on the street and visits the centre daily. “When I learned treatment was available, I did it quickly because I knew I needed it to survive. The drugs are expensive – and [here] I could get them free,” he says. Yet transient lifestyles, homelessness and efforts to avoid police crackdowns mean many clients find it difficult to come for follow-up treatment. MSF’s Dr Theresa Chan says the patients the clinic has seen in Phnom Penh are most likely the tip of the iceberg. “There’s probably more patients in [rural] areas who haven’t attempted to seek care so far away.” And the influx of patients means the team cannot treat patients as quickly as they would like to. By December last year, the team had treated 3,257 patients who were prioritised for treatment due to risk of liver complications and 2,500 patients remain on the waiting list. Key to tackling the worldwide prevalence of hepatitis C is access to treatment for all. But patent protection has kept prices up, allowing company monopolies which drown out competition and deny a fair price to hundreds of thousands of people who need these drugs to survive. MSF’s Access Campaign champions the idea that medicine should not be a luxury, pushing for access to, and the development of, life-saving and life prolonging medicines, diagnostic tests and vaccines for patients. “What good is a breakthrough medicine that people cannot afford?” asks Jessica Burry, Pharmacist for the Access Campaign. MSF treats people with hepatitis C in 11 countries. Since 2015, MSF has provided DAA treatment to around 5,000 people with hepatitis C. Of those who have completed treatment to date, the overall cure rate – measured by ‘sustained viral response’ – is 94.9 per cent.